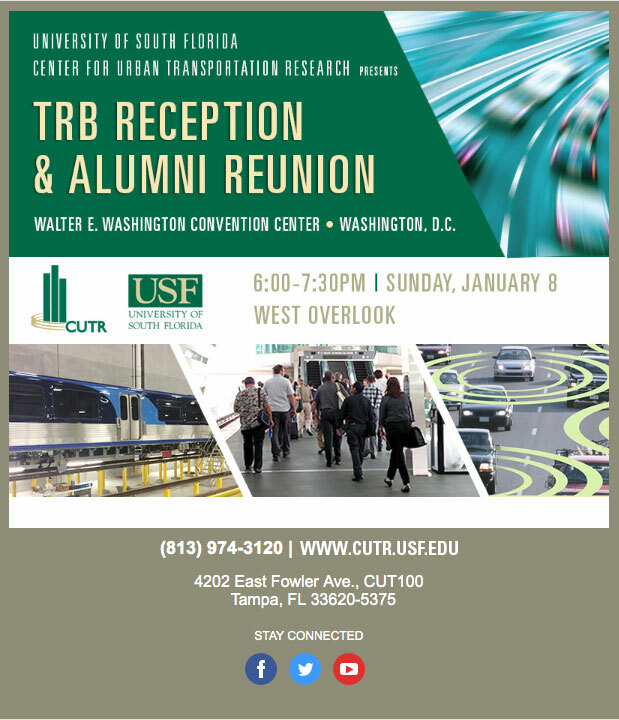 The Center for Urban Transportation Research (CUTR) at the University of South Florida (USF) was excited to participate in the Transportation Research Board (TRB) 2017 Annual Meeting in Washington, DC held on Sunday, January 8 – Thursday, January 12. CUTR has been actively involved with TRB since our establishment in 1988, providing 28 years of commitment to exploring ideas, breakthroughs, challenges, and solutions for building livable communities with transit through a strong, engaged, and growing network of industry leaders. Numerous CUTR faculty researchers serve as TRB committee and subcommittee chairs, and participation by our faculty and students in TRB Annual Meetings includes serving as panel moderators and session organizers, chairing sessions, serving as speakers and panelists, chairing poster sessions and making poster presentations, and authoring papers for publication. In addition, many of our researchers and students have been recipients of annual TRB awards. We are proud to be a part of such a prestigious and influential organization. It was our pleasure to invite you to our very first TRB Reception and Alumni Reunion on Sunday, January 8, 2017, from 6:00 pm -7:30 pm at the Walter E. Washington Convention Center, Washington, DC at West Overlook. We are grateful that you were able to stop by and connect with us. 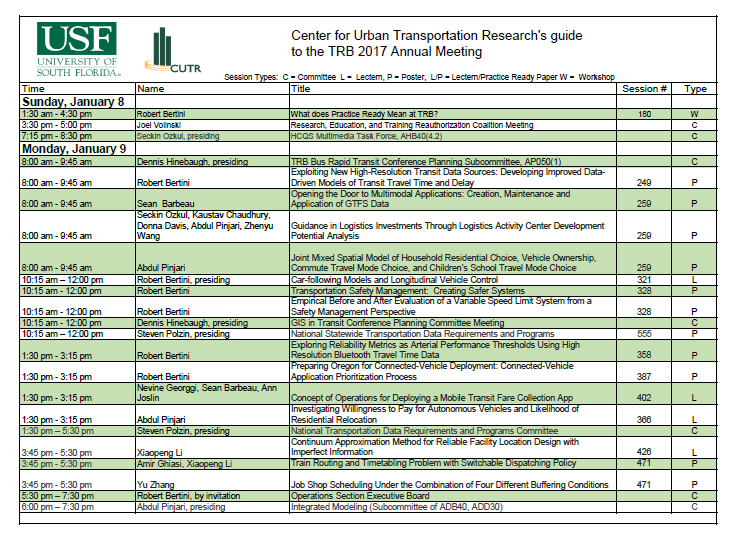 A guide to CUTR presentations and activities at the TRB 2017 Annual Meeting is available for download below.